The ability to target audiences is the #1 reason advertisers give for shifting spend between publishers or channels. Our advertisers want to leverage more customer data so they can target the right users with the right, personalized offers. That’s why we’re so excited to share how Bing is transforming Microsoft’s view of audiences, with two new pilot offerings focused directly on helping our customers reach their ideal audience. With In-Market Audiences, you can save time and reach more customers. In-Market Audiences are curated lists of users that have been determined to be in-market for a particular purchase category based on user signals across Bing, MSN and other Microsoft services. When these lists are associated to ad groups, you can target and modify bids for these audiences, similar to Remarketing in Paid Search lists. Say you’re a travel site looking to target searchers who are ready to book a summer vacation. Bing Ads looks for people who are clicking on ads related to hotels and flights, searching for relevant vacation terms, or checking out hotel reviews, for example, and predicts whether these users are ready to buy. Users identified as likely to purchase are included in the Travel & Tourism/Accommodations In-Market Audience, which you can associate to your ads. Since you know these people are more likely to book a vacation, you could increase your bid, for example, to help you capture this valuable audience. Simple to set up and easy to manage, In-Market Audience lists can help you increase conversions and improve bids and targeting. 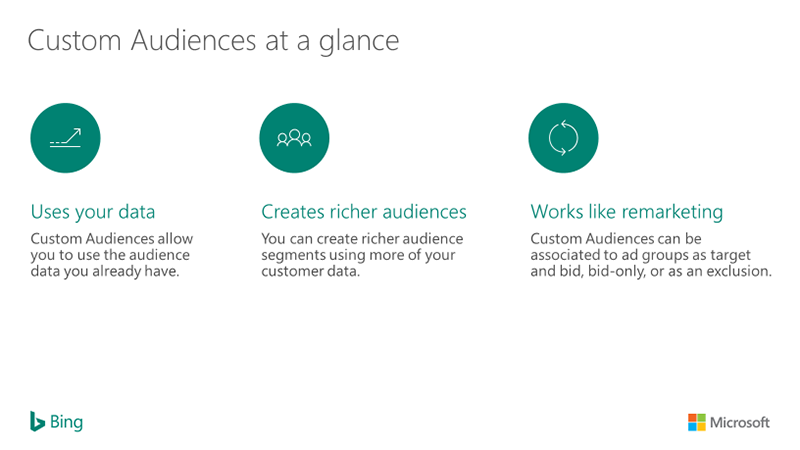 Bing Ads provides the curated In-Market Audiences lists, so advertisers don’t need to bring their own lists or data. Simply associate the appropriate In-Market audiences to your ad groups and you’re up and running. And it’s also easy to set up and manage associations in bulk across many ad groups. It’s quick and easy to get up and running – whether you’re a small business or a large agency. In-Market Audiences can be paired with other audience targeting solutions – like Remarketing or Custom Audiences lists, where advertisers provide their own customer data to reach an additional audience likely to convert in a particular category. If you’re interested in participating or learning more about this pilot, reach out to your Bing Ads account team. Custom Audiences is a type of remarketing list that is generated using your own customer data to create richer user segments. When your data platform manager (DMP) connects into our new Custom Audiences feature, you can import your Custom Audiences segments into Bing Ads for search remarketing. You can now target audiences that have been built using your own customer data -- like purchase history or subscription renewals – by importing these audiences into Bing Ads. By connecting your search campaigns with your CRM or other custom audience data, you can for instance, provide different ad copy to users who are your top spenders or increase your bid on ads intended to reach your platinum-status customers. To take part in the Custom Audiences pilot program, you must be using Adobe Audience Manager as your DMP. With Audience Manager, you can easily integrate your brand’s first-party data to target audiences using any CRM data, such as purchase history or subscription renewals. We’re actively working to integrate with other large DMP’s later this year. If you have questions regarding your DMP, please contact your Bing Ads account manager. We know that finding the right audience is important to you, and with these two new pilot programs, Bing Ads can help you find the perfect audience, increase your ROI, and create successful campaigns. Be sure to contact your Bing Ads account team to participate and learn more.